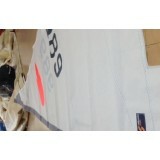 Our training sails are designed for club, training and general use. They are designed to be a cost effective, durable and a fully compatible alternative to class legal racing sails. Our training sails are Manufactured in high quality 5oz ripstop racing Dacron, with fully reinforced corner patches and batten pocket areas, and designed in house using the latest plotting and cutting software. We use hydraulically pressed, hard wearing stainless steel eyelets, and Jib windows are included where appropriate. All Prices includes battens, bags, tell tails, VAT and Delivery(to UK main land). Your can also find our Comet Cover here.